The late Sr James Mudzonga. 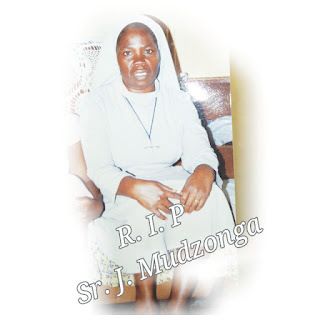 MASVINGO – Long-serving Roman Catholic nun, Sr James Mudzonga (70) has died. Sr Mudzonga died at Muvonde Hospital at Dreifontein Mission on February 3, 2019. She was buried at Dreifontein Mission Cemetery on Wednesday. Sr James joined the SJI congregation in 1966 and has worked in many different areas from pastoral work, to management working in boarding schools, school kitchens, mission laundries and at Caritas offices. She was born in Nyazvidzi Small Scale Farming Area in Gutu at Farm Number 303 in a family of five children and she was the second born in the family. Masvingo Catholic Diocese Chancellor, Fr Peter Oscar Chagweda confirmed the death in a telephone interview. She was at the time of her death stationed at Mashava where she was doing pastoral work. She worked at various missions in Masvingo and Gweru Dioceses. Sr Mudzonga was baptised at Mutero mission in 1959. She begun her candidacy on January 6, 1966, in 1969 she started her Postulancy, on January 3, 1970 she entered the Noviciate. She made her first profession in 1972 and her final profession in 1978. She worked at the following mission stations and parishes; Silveira, Gokomere, Berejena, Mukato, Triangle, Regina Mundi, St Bernard Masvingo, St Michael’s Ascot and Madamombe.